Every day in Ramadan is a challenge for Muslim wives, those who get occupied with how to prepare their kitchens, so cooking Iftar becomes an easy mission for them. However, it is often tricky for some women to keep high spirituality and Ibadah on track while committing to a non-stop full time job as housewives and mothers, taking care of children and house chores, and preparing meals for the family to enjoy breaking fast together. At the end of the day, Muslim wives find themselves spending most of their time in the kitchen, cooking Iftar, making deserts, and preparing drinks and snacks for the kids. This way, Ramadan passes and they feel sorry for not being able to seize the opportunity and make an advantage of it. Therefore, many women try to follow some guidelines and tips from experienced housewives on how to sharpen their saws and manage their schedules, so that they don’t spend their daytimes busy in the kitchen. Clean your kitchen and your fridge very well, get rid of all unwanted stuff to leave space for the food stock of the month. Prepare different ingredients for meals for the whole week, so you just do the final steps day by day. For example, prepare in your fridge a good amount of onions, garlic, and tomato sauce. Get meat and chicken washed and spiced. Prepare some homemade drinks like hibiscus, and leave them in the fridge. Write down everything you need for the month in a list and buy it all in once or twice. Try to be reasonable and don’t waste money. But don’t overdo it and seek out fruits and vegetables as needed. Stock up on your most commonly used ingredients like meat, rice, pasta, (pita) bread, oil, spices. List the types of meat and the amounts of each kind that you will need to cook per meal. After buying them, freeze and label everything. Put your daily plan starting with basic tasks followed by the less important ones to you. In this list, put basic duties as well as extra activities. This will act as a good reminder as well as an alert if you put too much or too less tasks. Note them down on a calendar and stick to preparing those meals. Keep the essentials in cupboards and on shelves that are within your reach to prevent scrambling for specific ingredients. If you’re really in for the long haul, prepare certain dishes ahead of time and freeze them. This will save time, and in turn this will maximize time spent in worship. Don’t overwhelm yourself with lists of food items you should prepare everyday onIftar, just make sure meals are nutritious and have all necessary elements. Don’t ever throw food in the rubbish, try to use any leftovers in other dishes or give it to the poor. And when there are none, eat simple meals. 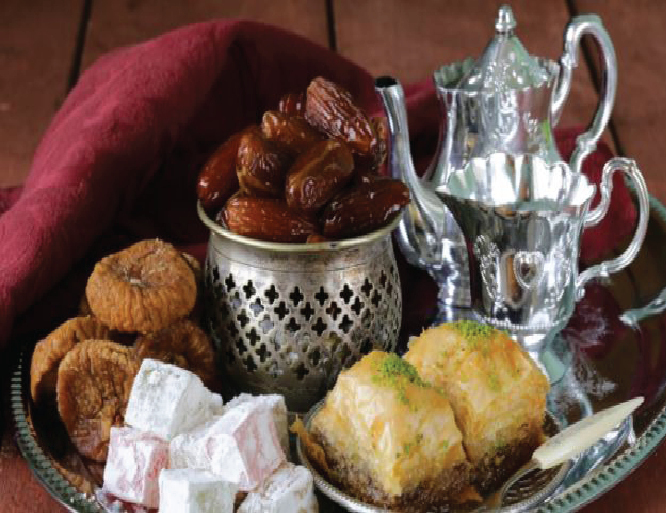 The Prophet (peace and blessings be upon him) used to break his fast with dates, milk, and a subsequent light meal in the spirit of disciplining one’s food intake. Eat simply. Drink soup. Eat fruit for dessert. It is healthier for your body and also shortens your kitchen time. Cleanup is tough during Ramadan, so clean while you cook to spare yourself from a mess after getting out of the kitchen. Time is truly the essence of this month. Avoid unnecessary outings, and put definite times if you can. Make it clear to your family and friends that Ramadan is a very special time to you and that you’d rather give more time to prayers and related activities than outings. Inviting guests to Iftar is rewarding, however, it can be a great load as well, unless you have a good plan for it. Cook simple meals that do not need much time or effort. Prepare some or most of the dishes one day before the visit if you can. Get someone to help you with preparing, lifting, and washing the dishes if feasible, and if you have kids, let them help you as well. Healthy food will give you the energy to work, pray, and do all your duties. Avoid eating junk food and food with big amount of fats as much as you can, this kind of diet will make you more sleepy and lazy in addition to its health hazards. Enough sleeping hours are very important for you to be able to complete the whole month with the same pace.